Easily the most anticipated interview on any Bond set would be to talk to James Bond 007 himself, Daniel Craig, and with more mystery surrounding Skyfall than previous movies and Craig’s increased involvement in the storytelling, we hoped he would open up a bit more than usual. Sadly, that wasn’t to be. For some reason, Craig tends to like doing his Bond interviews with producer Barbara Broccoli by his side, something that dates back to Casino Royale, but because there really is no one else involved with Bond as knowledgeable about how the movie came together than the heir to Albert Broccoli’s legacy with the Bond franchise, we hoped she could fill in any blanks. Mind you, this interview was done with a group of international journalists and some of the questions were better than others, so we tried to cull this brief interview down to only include the most pertinent and relevant information to the movie. Question: You had a really long break between the last movie and this one. How did that affect you in terms of coming back to the character and the production as a whole in terms of how it changed what it would be? 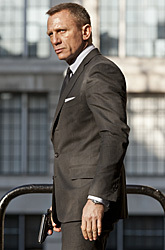 Daniel Craig: I was very sanguine about the whole thing, really, because there’s nothing I can do about the situation. MGM and Sony thankfully are back in the fold and we’re making the movie, which is mind of the bottom line. There were financial issues that were going on, which there’s nothing I can do about. I can make a phone call and go, “Please,” but that’s not really my style. It’ll work itself out, it won’t work itself out, but if it’s not to be, it’s not to be. I mean, I was hoping it would, I was desperate, and the longer things went on, the more desperate I became to make another one. Thankfully, we just carried on regardless. I mean, we had to quietly carry on because it was all in flux, but Sam got involved, the bones of the script came together, then John Logan got involved. We were constantly just at it. It gave us the chance to prepare ourselves in a way that we hadn’t had on the other movies – well, I certainly hadn’t in my first two experiences. Q: Let’s talk about Sam Mendes, because he’s the new addition from the past two movies. Bond’s always been a very producer-driven franchise I would say, and with Sam, you have a director who’s won an Oscar. What does he bring different to the franchise? Can you about working with him as opposed to some of the other directors who have worked on Bond? Barbara Broccoli: Well, in terms of it being a producer-driven movie, I think because it’s a franchise and because of its long history, we obviously are very much in control of how we set the movie up, but I think anyone who knows anything about movies knows it’s a very collaborative effort. We’ve always wanted a director that would put a stamp on the movie, so we’ve never been one to hire directors for hire. We always wanted someone who was a great director in their own right and a storyteller, and I don’t think you can get any better than Sam Mendes. When Daniel suggested him, we were unbelievably thrilled that he would be interested because he is such a fine director. Craig: I dunno. I just sort of had a flash, really. I had spoken to him at a party and we’ve known each other for years and obviously we’ve worked together before. I just said, “Would you be interested?” because it just seemed to me like a good idea. He’s English. He grew up watching Bond. He’s a huge Bond fan. He just instinctively knows about what Bond movies are about. He just seemed to be the correct choice. Q: How much has James Bond changed in this film? Q: It’s been mentioned by others that he has more of a conscience in this one. Craig: I’ve always been interested in that side of him, only because I think that there are consequences from actions, less so than maybe it used to be, but I think that it’s interesting to sort of play the emotion of everything that you see on screen. It’s not to say this movie’s become a piece of drama. I think what Sam has done is cast it in a way that means that we just have fabulously interesting characters to watch and be entertained by, and that their interaction is what the movie’s about. He’s a killer, that’s what he does for a living. To have a conscience about that I think is interesting, or to have some sort of effect on him that’s interesting. Q: We’ve also heard he’s kind of out of his comfort zone. Craig: Pushing him, I think is the best way to describe that. We’re always pushing him, and honestly, it’s just about making the best – because really the 50th anniversary is the whole thing, and that’s a lot of pressure because we’re trying to produce something that’s going to stand-out and be memorable, but we’re just pushing the characters as far as we can, physically and emotionally and just as far as we can within the context of the Bond movie. That’s been the aim. Q: “Casino Royale” was a very elegant movie, while “Quantum” was very modern. What is your perception visually of how this one is turning out? Craig: Well, visually we’re in very, very safe hands because Roger Deakins is shooting this movie, which is phenomenal. You can tell usually when you’re on a film set because you watch the monitors. I know you were watching stuff yesterday and you saw some explosions, maybe not the best of scenes, but even that scene is lit incredibly. That’s how Roger does it. Every scene is like that. It’s what he does. It’s his heart, and so, therefore, we’re in such safe hands there that it has a classic feel to it. It feels very modern at times, but I won’t lie to you, we tried to bring some of the feelings of older Bond movies into this film. It’s there, but this is a modern movie. We’re shooting digitally. We’re doing it in the most modern way possible. We’re just trying to make it feel as classic as we can. Broccoli: I can’t even say it. It sounds like a Fleming title, right? It’s not based on any Fleming story–there isn’t any left–but it has a real spirit of Fleming in it. I think the title reflects that too, and you’ll just have to see the movie to understand what the title means. Craig: Good Fleming titles always had double meanings and things, and that’s really from where the story comes, but it has a number of meanings, all of which apply in the movie. Q: Whenever there’s a Bond movie not based on a Fleming novel, you almost always get flack about the title, like with “Quantum of Solace.” This title “Skyfall” does sound very Bond, but once again, you have to deal with people not liking it. Broccoli: Believe it or not, it’s one of the toughest parts, choosing a title, because it’s the thing that brands the movie. We get a lot of flack about it. (Laughs) This one has been pretty good, people have liked this one. Craig: But we get a lot of flack about everything. I dig this one and I’m very pleased with this. I liked “Quantum of Solace,” but that got a lot of sh*t for it. Broccoli: But people now know what the meaning of the word “quantum” is, you know? Q: Does this movie follow directly after “Quantum of Solace” like that one did with “Casino Royale”? Craig: It’s a separate thing. Q: What did screenwriter John Logan bring to the movie? Broccoli: Well, it’s very usual in films that are this big and complex that you have several writers working on it. He’s a masterful writer, and he did extraordinary work on what was a very good script to begin with. He is the first person to say how good the script was that he contributed to. Also, obviously when Sam came on board, a director has a lot of input, Daniel has a lot of input, all the actors do, so that the script has evolved and it’s really exceptionally good. Q: How good is the villain in this one? Craig: (Makes motions as if waving that question away, which gets laughter) He’s all right. Won a few awards, apparently. There’s a kind of expression in sport that if you play with the best, it rubs off on you a bit, and Javier is one of the best in the business, so for me, it’s a really big treat. I’m a huge fan of his. He’s incredibly generous, just funny and we’re having a lot of fun together when we’re doing our scenes and again, it’s just one of those things. We had a wish list, and he just happened to be at the top of the wish list. Both Sam and I would like to have Javier to play this part. We knew that he would be the best Bond villain, we were very excited about it. And he said “yes”! Broccoli: It’s incredibly exciting watching these two actors in a scene together. I mean, you’re really in for something special. Q: What about his character? Craig: Very complex in many ways. Q: The explosion we watched yesterday seemed like it could be very nerve-wracking. Craig: Yes, it’s not in the movie, it’s just for you guys. (laughter) Yeah, for f*ck’s sake, we better blow something up. This is a Sam Mendes movie, it’s all talking. No idea. It wasn’t nerve-wracking for me, I have earplugs in. I couldn’t hear anything. Q: But this was a one-shot thing. If they didn’t get it right the first time, it took five hours or more to set it up again. Craig: Well, the shot that we’re doing today takes a week to reset so that’s a one-shot deal, but we do quite a lot of those one-shot deals on the movie. That’s just kind of the nature of doing a Bond movie, the number of things that may take five or six hours a day to the set. Those aren’t usual. The one we’re doing today is. Q: How do you manage to calm your nerves and remain focused? Craig: I just want to focus myself, so I’m thinking about what I’m doing and I make sure that I’m focused and ready to go. I don’t want to f*ck it up. It’s as simple as that. Broccoli: We all take it very seriously. Craig: I try not to take it too seriously. That’s for when we do the take, it’s like, we’re in a Bond movie, so I have to kind of be that person. Q: Do you feel like Sam has kind of upped the ante for the rest of the cast as well, since you have the likes of Albert Finney and Ralph Fiennes? Craig: That’s the Sam Factor. Broccoli: Yeah, Sam and Daniel. Everybody wants to work with Sam, everyone wants to work with Daniel. We were very lucky. The script was great. Craig: I mean, they may want to work with us and we’re nice people, but the script was in a really good place, and I think when you give actors good material, they just go, “Oh, okay, I get this.” They can see that there’s something there for them, that they’re not going to have to work that extra. I mean, it’s a lovely idea, but you get a script and it’s kind of disappointing, it’s very easy to turn that down. There’s too much work involved. Q: Is it true that we’ll see you and Moneypenny back? We know about Q, that was announced by his agent. 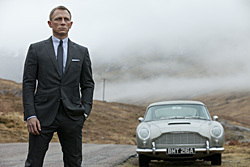 Broccoli: There is a lot of speculation about Bond, which is great. We’re very happy that people are interested and we got a great movie. Q: Can you tell us how the relationship between Bond and M will change? Craig: It’s just grown. It’s just growing, and that’s what’s great. Judi’s just such a wonderful – I mean, we have Judi Dench in the cast. She’s an amazing actress, and that relationship was always strong. I always thought it was strong. We got something going in “Casino Royale.” We’re running with it. We’ve just tried to improve it. I love what we’ve got together, and I’ve enjoyed working with Judi so much on this movie because we’ve had so much more to do together, so it’s great. Q: How is it shooting on the streets and the subways of London? Broccoli: We’ve had enormous cooperation, I think because we’re British. Obviously, the film is British and it’s our 50th anniversary and there’s a lot of focus on London at the moment with the Olympics and the Jubilee and everything, so they’ve been wonderful with us. We’ve had tremendous cooperation. Craig: Yeah, we’ve shot in places you wouldn’t normally be allowed to shoot and it’s down to the police and local authorities just been helping us out, and underground have been brilliant. Q: When you made “Casino Royale,” you had the Bourne movies you were being compared to. Now you have the last “Mission: Impossible” as that franchise seems to be upping its game as well. How do you guys feel about that? Broccoli: I’m always thrilled. I always say when good movies are out, it’s good for us because when there are good movies, audiences they go see them, they have a great time, they go back to the movies. So, I’m thrilled that “Mission: Impossible” is doing well, that the Bourne series did well. It’s what we want. We want good competition because we need people to keep going to the movies.